There are several different rose types, and each is very different. When planning to use roses in landscaping, whether as a single variety or in mass planting, it is very helpful to know the differences in each type. Some varieties need more care than others, some are better for foundation plantings, and some are excellent ground covers. Knowing the various habits of each variety before you plant will help you to have the landscape that you desire. All are beautiful, but each will create a slightly different look in the garden and have different growing requirements. These tea roses had heavily scented blooms, but the stems were short and straggly and often the heads drooped. In 1867 Guillot of France introduced what would be the first hybrid tea rose. Named La France, it had a strong fragrance and a large, full bloom. It was the first hybrid tea in existence. Over the years hybrid tea rose types have lost much of their scent, although they have become hardier and more colorful. Tea roses come in numerous colors, and the flowers are borne on long, sturdy stems. The hybrid teas are disease resistant and last a long time as a cut flower, which is part of their popularity. The blooms have from twenty-five to sixty petals. In a warm climate a tea rose can produce flowers for most of the year. These bedding roses are excellent in rose beds, as foundation plantings, and in borders. They work well as cut flowers and are a favorite in the garden. Jackson and Perkins was the first company to use the term floribunda in the early part of the twentieth century. It is a cross between a polyantha and a tea rose. This rose blooms in clusters and sprays of fragrant blossoms in many different colors. The plants can produce as many as thirty-six sprays in one season. They take three years to reach maturity and to produce prolific blooms, but most people who grow floribundas will assure you that the end product is worth the wait. Floribundas are a beautiful rose to use in mass plantings and in borders. They are very hardy and will continue to bloom throughout the season. The grandiflora rose is a hardy cross between a floribunda and a hybrid tea. They have large blooms that are clustered on long stems, making them good for cut flowers. The Queen Elizabeth is an example of a grandiflora rose. These roses are often taller than the teas or floribundas, often reaching a height of five feet or more. The leaves are large and shiny, making a beautiful backdrop for the showy flowers that bloom steadily throughout the season. Because of the height the grandiflora, these rose types do well at the back of beds, and as foundation plantings. Miniature rose types come in many different colors and petal combinations. They are perfect as container grown plants, or in the front of a rose bed or border. Blooms can be as small as one-fourth of an inch or as large as two inches. They don't make good cut flowers because of their diminutive size. Be sure and research the variety carefully because the miniature rose can vary in size from one to three feet in height. Minis are often fragrant, and a favorite of rosarians. A relatively new term in rose growing is the mini-flora. These roses are larger than the miniatures. Mini-flora are classified as roses whose leaf and bloom structure are smaller than a Floribunda but larger than the typical miniature. They make excellent container plantings. Micro -mini roses are just that. Some are small enough to be planted in a small teacup. These dainty roses hold all of the charm and beauty of their larger relatives, but in a tiny size, perfect for indoor planting and display. Large flowered climbers have stiff canes and usually have good repeat bloom. They can range in size from 8-20 feet. The blooms come in many colors and can have blooms singularly or in clusters. The rambler roses are usually older roses that have one main bloom per year, usually in the spring or early summer. Blooms tend to be small and come in large clusters. The canes are more pliable and therefore they are perfect for training on pillars, pergolas, and trellises. The sports of hybrid teas, floribundas, and other classes of roses resemble their bush counterpart except that they climb. These usually have a prolific spring bloom, followed by scattered blooms later in the late summer or fall. They come in hundreds of growth and bloom patterns, and thousands of colors. They can range from 1 foot to over 50 feet in height. Many of these roses have excellent repeat bloom. Of all the rose types, the heirlooms are usually the most intensely scented, and hardy. They often have a good resistance to diseases like black spot and mildew. The polyantha rose tends to be low growing and shrub-like. The numerous blooms are clustered along the tops of the branches. These rose types bloom profusely for a long season, and are very hardy and disease resistant. They make good foundation plantings, used as you would a shrub. 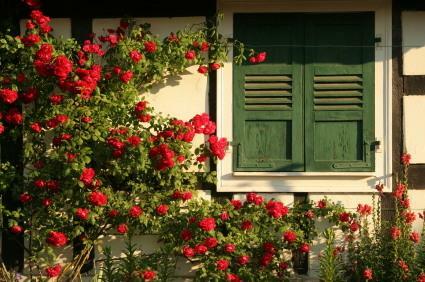 Growing and enjoying beautiful roses is a relaxing hobby, and a great way to beautify your landscape. By familiarizing yourself with the different types of roses you can create the best plan for your garden type, micro-climate, and style.